By 32 weeks of pregnancy you will find that your Obstetrician will want to see you every two weeks to check yours and your baby’s general health and well being. Then from about 35 weeks on they will drop this to every week until the birth of your baby. As you grow larger you will have some common complaints of sleepless nights, constipation and heart burn as your uterus moves around within you. There are some things you can do to combat these problems faced during pregnancy. If you find that you are restless at night time do your best to support your growing belly with a body pregnancy pillow or just extra pillows for support. Continue sleeping on your side and not on your back. It’s not just your tummy size that will be keeping you awake, between your regular bathroom trips, heartburn and an active little baby that seems to want to play when you are ready for rest! Pillows are not only great support for your belly at this stage of pregnancy but use them to prop yourself up slightly in bed to help reduce heartburn. Giving yourself this extra bit of height at night while getting some sleep will keep those stomach acids where they are supposed to be – in your stomach! While during pregnancy you should make sure you are drinking plenty of water, try to minimise the amount of liquids you intake about 1 hour before going to bed to reduce broken sleep with trips to the toilet throughout the night or wee hours of the morning. As for the active baby in your tum, well there really isn’t much you can do about that… just think of it as practice for when he/she is keeping you up all night!! But apart from that, the best thing you can do is try to rest and take naps during the day to catch up on missed sleep. To help reduce constipation remember to eat plenty of foods rich in fibre and drink plenty of water. Never take any laxatives, even over the counter constipation preventatives without first consulting your doctor. This advice goes for any type of pain relief, always speak with your doctor before taking any medications to ensure they are safe for you and your baby. The Hormone Relaxin Released During Pregnancy Can Cause a Waddle Effect When You Walk. Are you starting to walk like a duck and get your waddle on? Don’t worry, there is very good reason for this! With not only the changes in your posture causing you to walk differently, a hormone produced during pregnancy called relaxin can cause this waddle effect. Relaxin is actually created in your body to help loosen up and relax your pelvis and pelvic joints to prepare your body for the delivery of your baby. When the time comes to give birth you will be very thankful for this hormone, however until then become one with your inner duck! Over the next 8 weeks of pregnancy your baby is likely to gain more than half of his/her birth weight before delivery. Your baby currently weighs approximately 1.7kgs and measures in at 42cms from crown to toe. Your obstetrician will continue to measure your fundal height as a guide to your baby’s growth. All five of your baby’s senses have developed and are functioning. Your baby continues to prepare for life in the outside world, using his/her lungs to inhale amniotic fluid. Finger nails and toenails are completely formed and smooth. 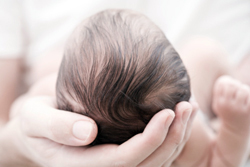 Your Baby May or May Not Have Hair When Born. Hair growth continues while the lanugo hair that once covered your baby’s skin starts to fall off before birth. You may notice small amounts of this fine hair once your baby is born, but won’t remain long before it completely disappears. Not all babies have hair on their head at this stage of pregnancy, some may never even grow hair while in the womb. The thickness of your baby’s hair at this stage in no way affects how thick or thin it will be later in life. It is one aspect of your baby’s body that will have many changes over time, some slight, others dramatic. Your baby’s movements may be at their peak this week of pregnancy, however as mentioned previously they will begin to reduce as so does the space inside you. It can be quite a worrying experience for some mothers as they can no longer feel as much significant and frequent movement from their baby. Counting fetal movements in later weeks however can put your mind at ease. You should still feel 10 or more fetal movements in a two hour time frame, if you are concerned and feel less than this, contact your doctor for advice.